MS Office | Live to Learn! We may require currency in both number & words in MS Access Reports. Some times we need numbers in both numerical format and in words. Here I am going to explain how to use VBA module to convert Number to Words in Microsoft Word. Cheques, invoices, bills, receipts are needs to have the currency format both in Numerical and words. The below script can be used in Microsoft Excel / Word / Access or any VBA program supported applications to convert the currency in number format to worlds (English). Calendar for 100 and more years.. Using keyboard shortcuts makes us to work very easy and fast.. In Microsoft Office word, there is an inbuilt macro to get the list of keyboard shorts. Here is the procedure to run this macro. Choose "Macro" from the Tools menu, then choose "Macros". If you are already familiar with other applications such as page maker, just go through this tutorial to know what menu does what in MS word. 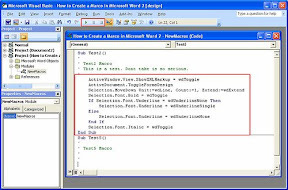 This tutorial based on MS - Office 98 - 2003 version. You can easily automate the installation of MS – Office.